Pour out upon us, O Lord, that same Spirit by which thy deacon Ephrem declared the mysteries of faith in sacred song, and so gladden our hearts that we, like him, might proclaim the riches of thy glory; through Jesus Christ our Lord, who liveth and reigneth with thee and the Holy Ghost, one God, now and for ever. Amen. Pour out upon us, O Lord, that same Spirit by which your deacon Ephrem declared the mysteries of faith in sacred song, and so gladden our hearts that we, like him, might proclaim the riches of your glory; through Jesus Christ our Lord, who lives and reigns with you and the Holy Spirit, one God, now and for ever. Amen. 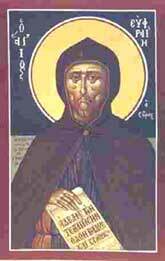 Ephrem (or Ephren or Ephraim or Ephrain) of Edessa was a teacher, poet, orator, and defender of the Faith. (To English-speakers, the most familiar form of his name will be "Ephraim." It is the name of the younger son of Joseph, son of Jacob (see Genesis 41:52), and is thus the name of one of the largest of the twelve tribes of Israel.) Edessa (now Urfa), a city in modern Turkey about 100 kilometers from Antioch (now Antakya), was a an early center for the spread of Christian teaching in the East. It is said that in 325 he accompanied his bishop, James of Nisibis, to the Council of Nicea. Certainly his writings are an eloquent defense of the Nicene faith in the Deity of Jesus Christ. He countered the Gnostics' practice of spreading their message through popular songs by composing Christian songs and hymns of his own, with great effect. He is known to the Syrian church as "the harp of the Holy Spirit."